The Iceman Charity helps more than 2.400 children at Wat Sakraeo orphanage in Thailand for a better start in their future. The Iceman Charity is not an official organization. The Iceman Charity is a mission! My wish is to bring smiles to the faces of underprivileged kids – the kids who nicknamed me The Iceman. Inspired by the plight of children at one of Bangkok’s biggest orphanages, I decided to bring them just a little joy. It started with a simple objective – give each and every one of the 2,446 orphans a taste of happiness: an ice cream treat. Their joy at this simple pleasure changed my life and I created the Iceman Charity. At first, I would give the Wat Sakaew Orphans Foundation a percentage of my income to support its professional mission – the welfare of the children and their development into productive, well-educated adults. Later, friends, colleagues and clients got involved, helping to make an even bigger impact on the lives of these children. Within the years we invested more than 30 Mio THB at the Wat Sakraeo Orphanage. We are on Facebook! Become a Fan of the Iceman Charity and be the first to receive news and see how we help children at Wat Sakraeo Orphanage in Thailand. The Iceman Charity was founded 12 years ago, when Volker Capito went to the temple on a New Years day, invited by a Thai friend to start the new year doing something good. 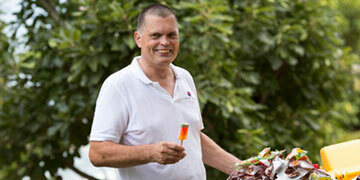 The name of the Iceman Charity was given, when Volker Capito started to serve an ice cream desert after lunch. Some children called him "the iceman". Actually he thought it is a bit waste of money to buy expensive ice cream (instead of rice). But when you see the tears in the kids eyes when they get an ice cream, than you understand he is doing it the right way!